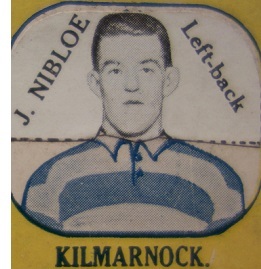 Born in Corkerhill, Glasgow born left back Joe Nibloe played junior football, initially as a centre forward, for Shawfield Juniors (for whom he once scored 5 goals in a game) in 1922 and Rutherglen Glencairn in 1923 but he converted into a left back and was offered a professional contract by Kilmarnock in June 1924. 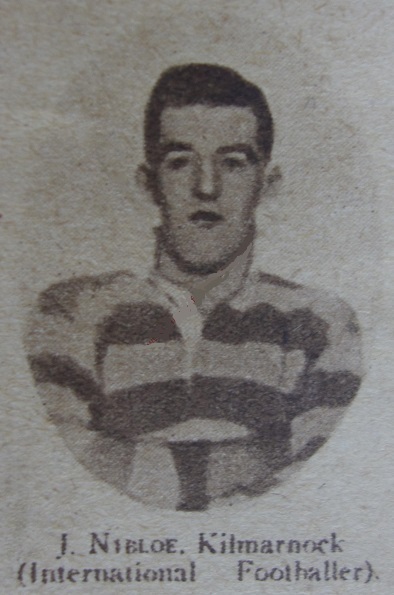 In his eight years at Rugby Park Nibloe he made 279 appearances for the Killies, he helped them win the Scottish Cup in April 1929, defeating Rangers 2-0. Shortly after the Final he was called up for the first of his eleven appearances for Scotland on 13th April 1929, featuring in a 1-0 victory over England at Hampden Park. All his 11 Scottish caps came while he was with Kilmarnock and he is still today the clubs most capped player, his last appearance for his country came in May 1932 against France. Nibloe also played twice for the Scottish League in October and November 1929 against The Irish League and The Football League respectively. 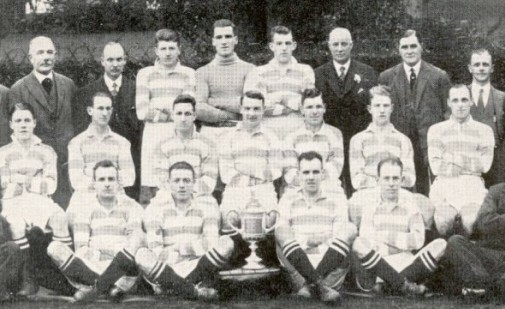 Kilmarnock reached the Scottish Cup Final again in April 1932 but this time Nibloe had to settle for a runners up medal as the Killies lost to Rangers in a replay. Soon after this he signed for Aston Villa for the 1932-33 season for a fee of £1800 after a disagreement with Kilmarnock over a benefit match. Nibloe made his Football League debut at Wolverhampton Wanderers in December 1932 but struggled to find a regular place in the Villa team in that first season, making just 12 appearances as the team finished runners up to Arsenal in Division One, being kept out of the side by the near veteran Tommy Mort. 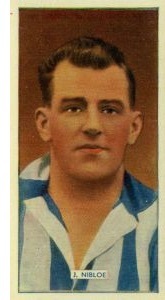 However the following season (1933-34) Nibloe dislodged Mort from the team and displayed excellent form in his 40 campaign appearances and it caused something of an uproar when he signed for Sheffield Wednesday in the summer of 1934 in a part exchange deal which saw George Beeson going to Villa Park along with £2,500. Wednesday’s signing of the experienced 30-year-old was seen as something of a coup by the club, no doubt the influence of manager Billy Walker made a difference as Walker had been a team mate of Nibloe’s at Villa the previous season. Competition for the left back spot was keen even though Wednesday had lost Ernie Blenkinsop to Liverpool the previous season, Ted Catlin had stepped into Blenkinsop’s boots and Nibloe was forced to switch to right back to secure a place in the team. He made his Wednesday debut in the opening fixture of the 1934-35 season on 25th August 1934, in a 4-1 home victory over Stoke City. Nibloe played in five out the six FA Cup ties in 1935 as Wednesday won the trophy, beating West Bromwich Albion 3-2 in the Final at Wembley, with Nibloe missing just the 3rd round home tie against Oldham Athletic in January. Nibloe made his final appearance for Wednesday in May 1938, in his final two seasons he was more of a fringe player as his place was challenged by Jack Ashley. He retired from playing competitive football at the outbreak of World War Two at the age of 35.